For the app to work well it needs to reference reliable sources of bibliographic data. Already in progress is some code that is capable of pulling bibliographic data from the University’s library system Aleph via the XService API. But more are needed. The question we need to answer is which sources to concentrate our efforts on in terms of 3rd party services to lookup ISBN numbers. These initial recommendations have given us a good starting point. We’ll discuss, test and feedback on findings in a later post. Posted in development, m-biblio, mlibs and tagged #mlibs, Aleph, Amazon, bibliographic sources, COPAC, jisc, m-biblio, mbiblio, university of bristol on 2012/02/02 by Dave Kilbey. 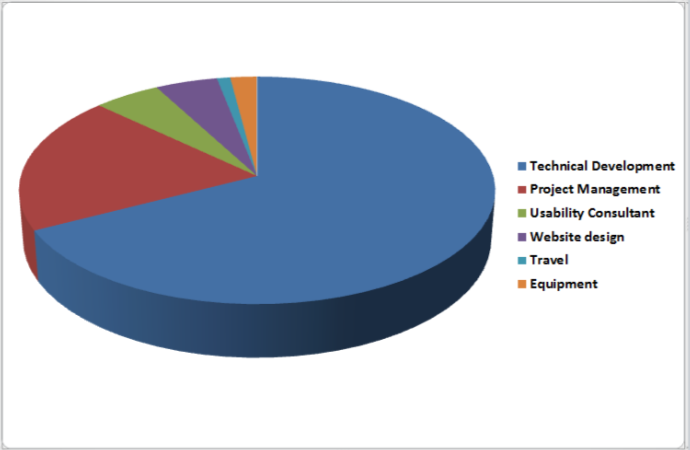 The general shape and form of the budget for this project is available in the budget sheet below. All data is anonymous. But for those more keen on graphics than numbers here’s a pie chart showing a simplified version of where the money is allocated. Posted in m-biblio and tagged #mlibs, budget, jisc, m-biblio, m-library, mbiblio, project plan, university of bristol on 2011/12/09 by Dave Kilbey. As with any project there are various risks associated with this one. Perhaps first and foremost is that we have just one developer working on this project. If he is unable to complete the project for any reason we will need to hand the work on to someone else within the University’s pool of developers. Most of the developers work on a multitude of different projects simultaneously with different start and end dates and there is often capacity for someone else to pick up work in other projects as and when necessary. Much the same applies to the Project Management post. As previously mentioned there are certain limits to the technology currently available in smart phones. This is not necessarily a threat to the project but a limitation which needs to be understood in terms of directing effort in the project. One of the elements of the project we were keen to investigate is whether Near Field Communication (RFID) can be used to facilitate the generation of bibliographic references within a library context. However, the technology for detecting this form of code is not widely available currently. There are several devices which can facilitate working with RFID codes on certain mobile phone platforms and we will investigate those but it is likely that the core element of the project will need to focus on other forms of object identification such as bar codes and QR codes. Advisory Group – a small risk associated with the Advisory Group is the amount of time people have available for supporting the work of the project. This is something the project manager is currently looking into and efforts are being made to ensure that sufficient time is allocated by advisory group members throughout the duration of the project. We have also taken action to recruit several other advisory group members partly due to the above but also due to certain gaps that we identified in terms of knowledge and/or expertise. The “time” risk stated above largely relates to the ability of people to attend physical meetings. However, we have also established a wiki and an e-mail list which means that any information required can be garnered as and when required without impinging on staff time to any substantial level. Posted in m-biblio and tagged #mlibs, jisc, m-biblio, m-library, mbiblio, project plan, risk, risk analysis, risks, university of bristol on 2011/12/08 by Dave Kilbey. The project started at the beginning of November and is now due to finish at the end of July 2012. 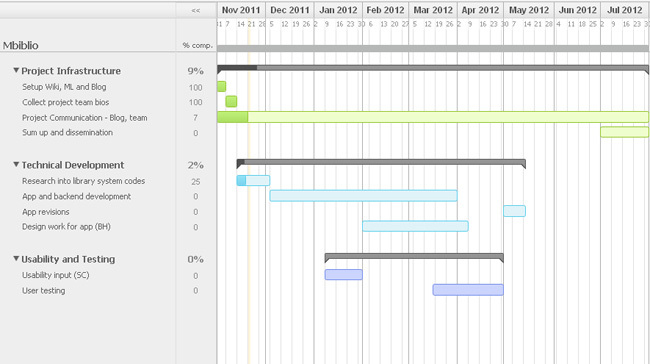 The following Gantt chart gives a brief overview of the project in terms of its work packages and projected timelines for their completion. In terms of an overall methodology for the management of the project, although the project manager is Prince 2 qualified it is more likely that we will adopt a more lightweight methodology such as Agile given the nature, short duration and size of the project. Posted in m-biblio and tagged #mlibs, gantt, jisc, m-biblio, m-library, mbiblio, project plan, timeline, university of bristol, work packages on 2011/12/07 by Dave Kilbey. Mike is a Senior Web Developer / Researcher based in IT Services / R&D with over ten years experience of software development. Mike was technical lead on the Mobile Campus Assistant and MyMobileBristol projects and has experience in developing for mobile platforms, including native and mobile web solutions. Dave is currently working as an IT trainer for the University of Bristol. He is an experienced project manager and registered PRINCE2 practitioner and is currently managing the JISC-funded Nature Locator project. Stuart Church has been employed in usability, web development, accessibility and information architecture roles for the last eight years. He has worked on a wide variety of web-based projects for the University as well as for other clients, including The Millennium Mathematics Project, Microsoft, Defra, and Process Management International. Stuart will work closely with Ben Hayes, the project’s Web Designer, to fulfil the essential requirements of Usability and Stakeholder components. Ben has been designing websites and web applications for commercial and HE clients for a number of years. He is responsible for creating easy-to-use interfaces, HTML and CSS coding, branding, accessibility and usability. Ben has an MSc in Computer Science from Oxford Brookes University (passed with Distinction, 2001) and an MPhil in Computer Speech and Language Processing, awarded by the University of Cambridge in 2001. Julian is Subject Librarian for Chemistry, based in the Chemistry Library, and a Web Developer for the University Library. Assistant Librarian and then Information Officer for Redland Technology Ltd (the R&D arm of Redland Group PLC, manufacturers of building materials), 1983 – 1987. Joined the University in Feb 1987 as Senior Library Assistant in charge of the Chemistry Library, and has since become Subject Librarian for Chemistry, based in the Chemistry Library, and a Web Developer for the the University Library (from 1997 onwards). Since 2007 he has been involved with a trial of RFID taking place in the Chemistry Library, using a system from 2CQR for circulation of stock (in conjunction with the Aleph library computer system), self-issue, and security. 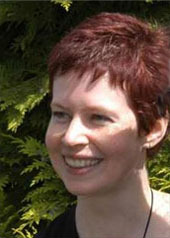 Ruth Dawson is a Library Specialist IT Support Officer in IT Services at the University of Bristol. She is a member of the IT Services Special Interest Group on Mobile Devices and has over a decade of experience supporting innovative research and development in the IT Services R&D/ILRT. As a member of the Service Delivery Group, Ruth provides IT support and advice to both academics and members of the other support services, including the Library and Educational Support Unit. Debra is the Faculty Librarian for the Faculties of Science and Engineering at the University of Bristol and has over 12 years professional experience in University Libraries. Debra leads the Faculties’ Subject Librarian teams, co-ordinating academic liaison, collection management activities, information literacy programmes and promotion of the collections and services, in support of teaching, learning and research. Mike is currently Head of Information Management at the University of Bristol. He has over 20 years of professional experience in University Libraries, including five as a senior manager. Mike currently has responsibility for managing all aspects of providing access to information resources in print and electronic media. His current interests include achieving value for money in the procurement of information resources. Posted in m-biblio and tagged #mlibs, jisc, m-biblio, m-library, mbiblio, project plan, team, university of bristol on 2011/12/07 by Dave Kilbey. The final outputs of this project will include a mobile phone application which, in the first instance, will be coded natively for the iphone platform. This application will enable students to record and organise references to any books and journals they utilise. It is anticipated that the application will also be able to generate references specific to relevant articles within each Journal (those that include Digital Object Indentifiers anyway). The application may utilise an active form of recording (which might include scanning a barcode or utilising a QR code) but we will also be looking into the possibility of embracing Near Field Communication technologies such as RFID tags (the Uni’s Chemistry Faculty has implemented the use of these throughout its library). The mobile phone application itself will have two functional elements to it. The first will be the “surface layer” which will provide the facility for students to organise their bibliographical references. The second will be the provision of usage data to the library. The latter will be of considerable benefit to the library since unless an item is physically removed (booked out) then gathering information on usage patterns for resources is extremely difficult. They will therefore be able to start filling this information gap. If such a methodology were to be made widely available to, and adopted by, students it is feasible that the data collected by libraries could be used to inform future purchasing patterns and stock levels for books and journals. Libraries could then begin to more closely match requirements to the items they stock with potential for saving money on unrequired items by reducing purchasing, shelving, admin and preservation costs. The product will be made available freely within the HE community and other institutions interested in looking into or developing this technology may therefore make a start using our application and research as a platform. Posted in m-biblio and tagged #mlibs, jisc, m-biblio, m-library, outputs, project plan, university of bristol on 2011/12/07 by Dave Kilbey.